Please see below for the detailed Conference Program and basic Conference schedule. The Conference includes two keynote speakers, two additional guest speakers, 69 lectern presentations, 38 student posters, and more! Transportation from UTSA DT Campus by private car and taxi after the meeting. Participants return to hotels on their own. 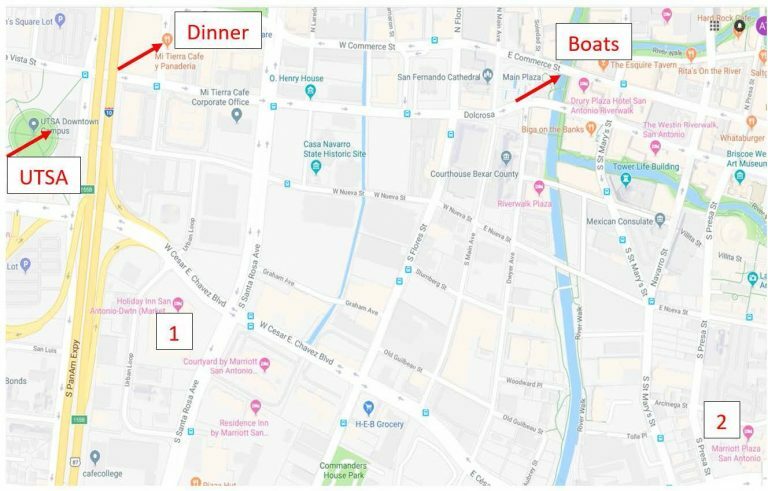 Boats will depart from the Main Plaza location shown on map starting at 6:00pm. The distance from the UTSA Campus to the boat landing is 0.6 miles (10-12 min. walk). There will be 2 small buses for those that prefer not to walk. Form the Main Plaza to the restaurant is a short walk or if you prefer bus ride. After dinner the buses will drive you back to the 2 official hotels of the conference (1 & 2 on map).